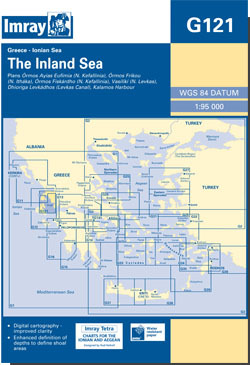 The Ionian Sea east of Levkas and Keffalinia. Scale: 1 : 93,400. Larger scale plans of Ormos Ayias Eufimas (Keffalinia), Ormos Frikon (Ithaki), Ormos Fiskardho (Kefalllinia), Ormos Vasilikas (Levkas), Dhioriga Levkadhos (Levkas Canal). For this 2014 edition, the chart has been fully modernised and updated throughout. In addition, the sketch plans of Órmos Ayiás Eufimia and Órmos Frikou have been replaced with fully georeferenced plans compatible with WGS84 Datum.